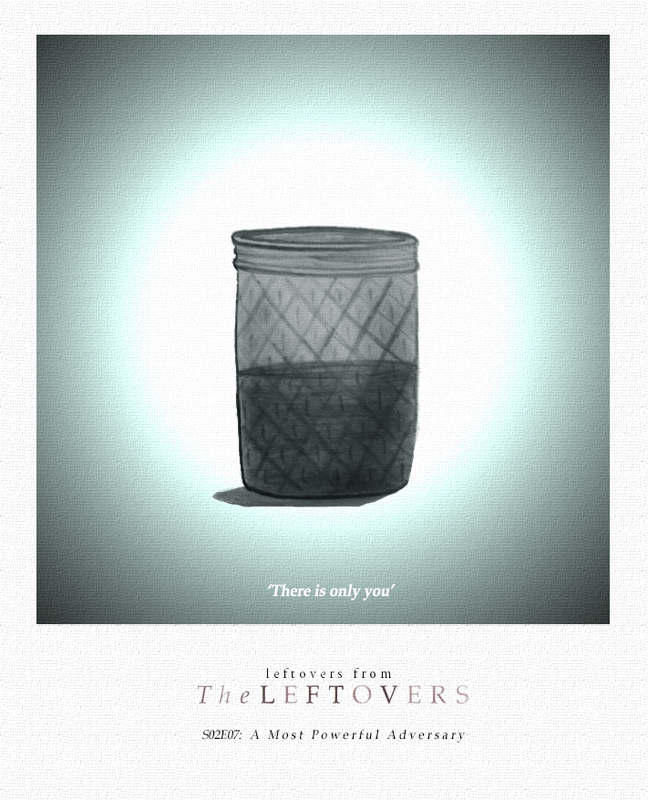 During the first season of The Leftovers, Argentinian filmmaker, writer and columnist Pablo Martin was inspired to create artwork for each episode—what he called "pencil postcards" at the time. Martin has been similarly churning out illustrations this season, drawing two pieces that reflect each episode, all of which you can find on his Tumblr and Twitter. 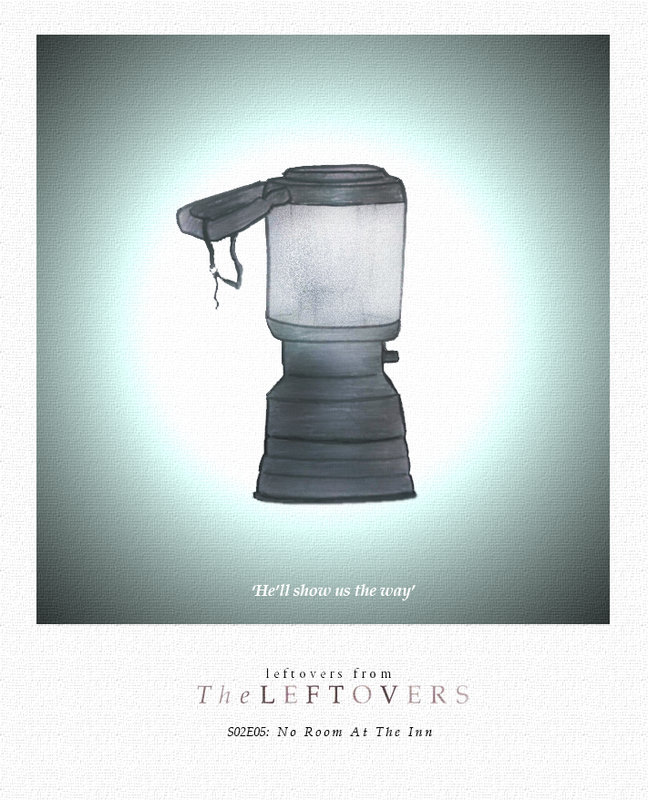 Below, Watching The Leftovers features a gallery of Martin's pieces—one selection from each episode—accompanied by a short description of what inspired each one. Martin: "I choose the Jarden’s spring water because I thought it perfectly explained this episode. Even the first minutes of the episode were marked by the water of this lake. The water might be an 'axis mundi,' it may have miraculous powers and it might be a myth or just a souvenir, as much as the Miracle National Park itself. Maybe Dr. Goodheart has the answer." Martin: "The cinder block is a metaphor of the weight on Kevin’s foot. From the death of Patti to the weight of living a common life and realizing there’s nothing more to life than that. Now, is this weight saving him from drowning or avoiding him from disappearing?" 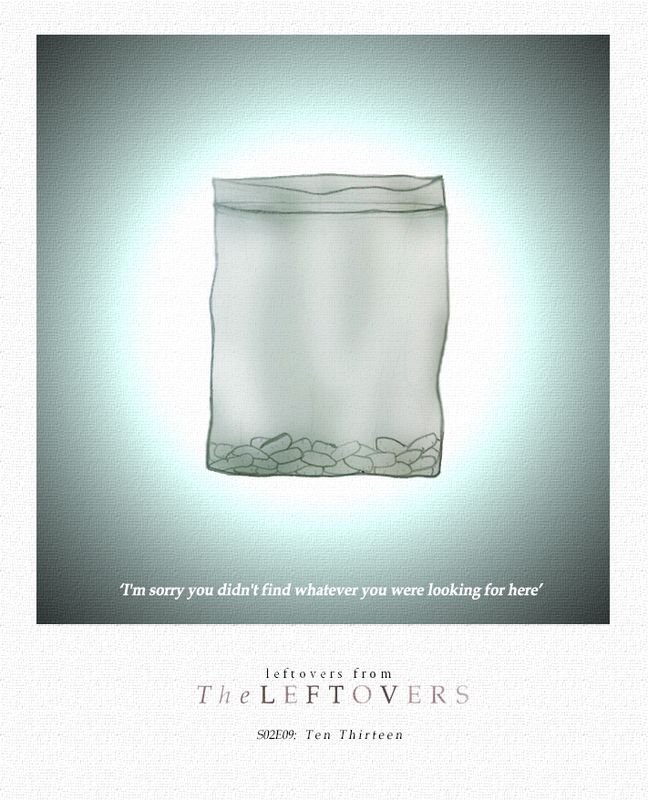 Martin: "Tom and Laurie realize they need something to fill the void after people left the Guilty Remnant. Like nicotine gum, they need a placebo strong enough to fill that void. Are Holy Tom’s hugs real? Will they be enough to win them over?" Martin: "Nora will make everything to keep her family together. She won’t let anyone escape from her anymore. 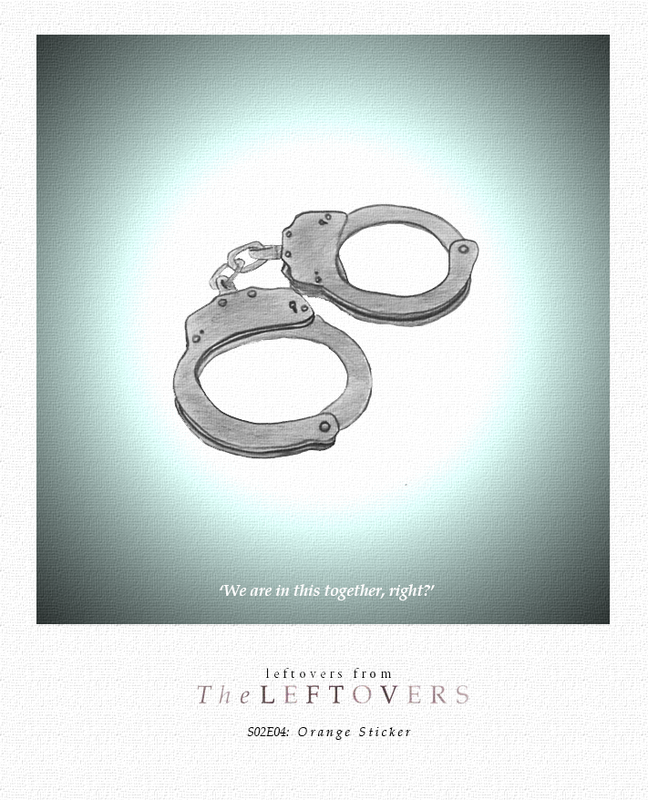 She handcuffed herself to her new family, to her relationship with Kevin. Whatever happens she needs to be at the same geographical spot. But, is it love? or as Patti said, is it damage control?" Martin: "I choose the camping lantern in representation of Matt’s hope. He’s always hoping for the good in people, hoping for Mary to come back, hoping everything’s gonna be OK even in the darkest times. Matt’s hope is the light at the end of the tunnel." Martin: "After Erika and Nora's face off, I think Erika realized Nora was the one who threw the rock at her house. But why? Why would she feel hostile towards them? Is Nora's anger about how the Murphys broke her hopes of feeling safe in Miracle? Her hopes of a new and peaceful beginning? Or is Nora just being Nora? When Erika throws a rock to Nora's window, I think is her way of saying: 'Your home is as broke as mine, we are equals, our pain is the same, you didn't evolved.'" Martin: "When Patti asks Kevin why anyone would want to kill her, she explains it's related to her beliefs, with her truth. She says Kevin assassins share their beliefs with their victims. So, Kevin wants to destroy families too? Is there a little assassin boy inside of him? Or was she just trying to confuse Kevin with her helixes, spirals, zigzags and circles thoughts? And I wonder, what do we really know about Kevin's family, about his mother? Was he adopted too? When Patti talks about the abandoned child, was she talking about Kevin?" Martin: "Throughout this episode, we saw Meg getting more and more frustrated with her life. Frustrated with the fact that everything in her life is a lie. Her marriage, sending her mother's ashes to space, the psychics, the cults—not even the Guilty Remnant make sense to her anymore. She needs to step it up, she wants to get her grief noticed. Evie was the first one noticing that pain when she gave her the baby carrots, the first one to tell her, 'Sorry about everything being a lie, nobody ever finds anything in Miracle, because it's a lie, too.’"
Martin: "As the bullet went right through Kevin's chest, this episode went through the screen to our hearts. To recover his family, Kevin needed to die—not once, but twice. As I see it, the first one was about killing the voice inside him, represented by Patti, that dark thoughts every single one of us has. And the second one was more about himself, about his 'rebel-self,' more about taking responsability for everything he has done and realizing (as his father said) 'this is enough,' family is enough, and it's OK if sometimes it's a lot to handle, it's OK if sometimes he feels like killing himself, it's OK if he sometimes feels like he wants to blow his life up or depart from it. It's a sentiment everyone has. He just needs to be honest and speak more about it and don't let it kill him from inside. It's funny that the first time he's verbalizing what he really feels, John shoots him, but at least he was being honest. In a way he forgives John because he understand, more than anyone else, what's he's going through. He was John last season. Whatever journey Kevin had to overcome it was worth it, now he gets it, 'family is everything' (as Meg weirdly said), and at the end, everything he wished for got (as Wayne promised) granted. Now he's home." Martin is on Tumblr, as well as Twitter, Instagram, and Facebook.